Bhavnagar pronunciation is a city in the Bhavnagar district of the Saurashtra region of the Gujarat state of India. It was founded in 1724 by Bhavsinhji Gohil (1703–1764). It was the capital of Bhavnagar State, which was a Princely state before it was merged into the Indian Union in 1948. It is now the administrative headquarter of the Bhavnagar district. Bhavnagar is the fifth largest city of Gujarat state after Ahmedabad, Surat, Vadodara and Rajkot. Bhavnagar is situated 198 km from the state capital Gandhinagar and to the west of the Gulf of Khambhat. It has always been an important city for trade with many large and small scale industries along with the world's largest ship breaking yard, Alang located 50 km away. 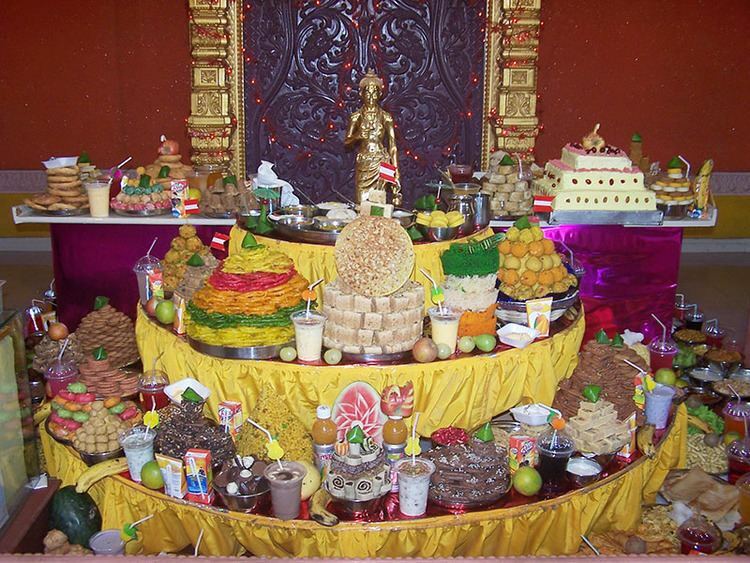 Bhavnagar is also famous for Popular Gujarati snacks 'Ganthiya'. The Gohil Rajput of the Suryavanshi clan faced severe competition in Marwar. Around 1260 AD, they moved down to the Gujarat coast and established three capitals: Sejakpur (now Ranpur), Umrala, and Sihor. Sejakpur was founded in 1194. In 1722–1723, the forces led by Khanthaji Kadani and Pilaji Gaekwad attempted to raid Sihor but were repelled by Maharajah Bhavsinhji Gohil. After the war, Bhavsinhji realized the reason for repeated attack was the location of Sihor. In 1723, he established a new capital near Vadva village, 20 km away from Sihor, and named it Bhavnagar after himself. It was a carefully chosen strategic location because of its potential for maritime trade. 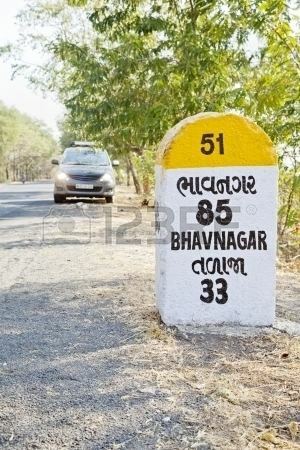 Naturally, Bhavnagar became the capital of Bhavnagar State. In 1807, Bhavnagar State became a British protectorate. Bhavsinhji ensured that Bhavnagar benefited from the revenue that was brought in from maritime trade, which was monopolized by Surat and Cambay. As the castle of Surat was under the control of the Sidis of Janjira, Bhavsinhji brokered an agreement with them, giving the Sidis 1.25% of the revenue by Bhavnagar port. Bhavsinhji entered into a similar agreement with the British when they took over Surat in 1856. Whilst Bhavsinhji was in power, Bhavnagar grew from a small chieftainship to a considerably important state. This was due to the addition of new territories as well as the income provided by maritime trade. Bhavsinhji's successors continued to encourage maritime trade through Bhavnagar port, recognizing its importance to the state. 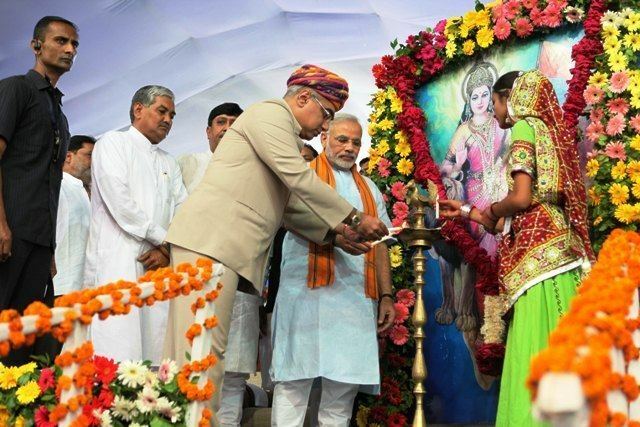 The territory was further expanded by Bhavsinhji's grandson, Vakhatsinhji Gohil, when he took possession of lands belonging to Kolis and Kathis, obtained Rajula from the Navab Saheb Ahmad Khan, and merged Ghogha Taluka into the state. In 1793, Vakhatsinhji conquered the forts of Chital and Talaja, and later conquered Mahuva, Kundla, Trapaj, Umrala and Botad. Bhavnagar remained the main port of the state, with Mahuva and Ghogha also becoming important ports. Because of the maritime trade, the state prospered compared to other states. During the late 19th century, the Bhavnagar State Railway was constructed. This made Bhavnagar the first state that was able to construct its railway system without any aid from the central government, which was mentioned in The Imperial Gazetteer of India. Mr. Peile, a political agent, described the state as follows: "With flourishing finances and much good work in progress. Of financial matters I need say little; you have no debts, and your treasury is full." Between 1870 and 1878, the state was put under joint administration, due to the fact that Prince Takhtsinhji was a minor. This period produced some notable reforms in the areas of administration, revenue collection, judiciary, the post and telegraph services, and economic policy. The ports were also modernized. The two people who were responsible for those reforms were E. H. Percival of the Bombay Civil Service and Gaurishankar Udayshankar Oza, Chief Minister of Bhavnagar State Bhavnagar Boroz. In 1911, HH Maharani Nundkanvarba of Bhavnagar was awarded the Order of the Crown of India, the highest Imperial award for women of the Empire. The former princely state of Bhavnagar was also known as Gohilwad, "Land of the Gohils" (the clan of the ruling family). 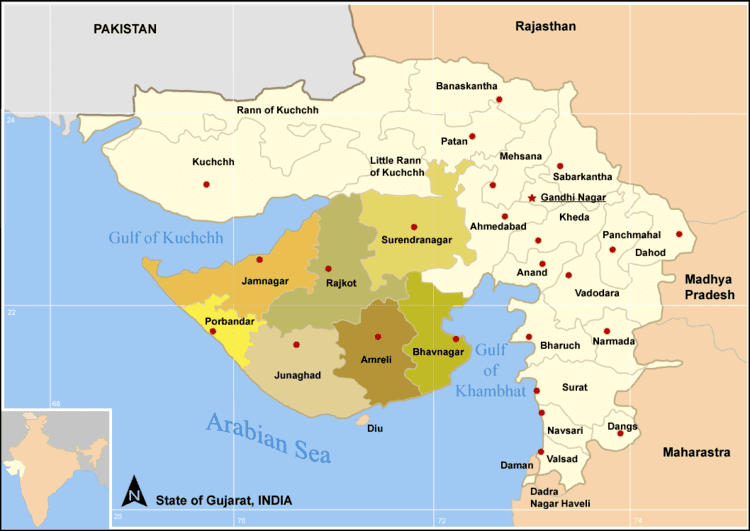 Until the independence of India in 1947, Bhavnagar was an independent state ruled by the Rajput Gohil family. In 1947, the Deputy Prime Minister of the newly independent Indian Union Sardar Vallabhbhai Patel undertook the ambitious and complex process of unifying 565 princely states with the Union of India. The last ruling Maharajah of Bhavnagar, Krishnakumar Sinhji handed over the administration of his Bombay State to the people's representative in 1948. The current royal family of Bhavnagar comprises Maharajah Vijayraj Singh Gohil and Maharani Samyukta Kumari, Prince Yuvraj Jaiveerraj Singh Gohil, and Princess Brijeshwari Kumari Gohil. The erstwhile royal family of Bhavnagar continues to lead an active role in the public eye as well as in business (hotels, real estate, agriculture, and ship-breaking) and is held in high regard by the population both in the city as well as areas that comprised the former princely state of Bhavnagar. Bhavnagar is a coastal city on the eastern coast of Saurashtra, also known as Kathiawar, located at 21.77°N 72.15°E﻿ / 21.77; 72.15. It has an average elevation of 24 metres (78 ft). It occupies an area of 53.3 km2 (20.6 sq mi). The general slope dips towards the northeast at the apex of Gulf of Khambhat. A small non-perennial river named Kansara Nala passes through the outer area of the city. Bhavnagar has a hot semi-arid climate (Köppen: BSh), with hot, dry summers from March to mid-June, the wet monsoon season from mid-June to October (during which the city receives around 550 millimetres (22 in) of rain on average), and mild winters from November to February. The semi-arid classification is due to the city's high evapotranspiration. The average temperature from November to February is around 20 °C (68 °F), with low humidity. Due to proximity to the sea, the climate remains fairly humid throughout the year. The highest recorded temperature was 54 °C (129 °F) on 26 May 1988, while the lowest recorded temperature was 2 °C (36 °F) on 11 December 1973. The region of Saurashtra is a geologically active part of West India, and falls in the seismic zone 3 of the Zoning Map of the Bureau of Indian Standards. The region as a whole and the area around Bhavnagar, in particular, has been tectonically unstable. Between 9 August 2000 and 15 December 2000, there was a series of earthquakes in east Saurashtra with epicenters in Bhavnagar. 132 earthquakes between magnitude 0.5 to 3.8 were recorded. There were five earthquakes greater than magnitude 3, with a maximum magnitude of 3.8. These events were confined to an area which covered the southern part of Bhavnagar city and Tarsamiya village on the outskirts of the town. There was no loss of life recorded due to this earthquake. According to historical records, an earthquake of magnitude 7 occurred near Bhavnagar in February 1705. Earthquake swarm activity also occurred in and around Paliyad (60 km north of Bhavnagar) during July–August 1938 for about two months, with four earthquakes of magnitude greater than or equal to 5 and a maximum magnitude of 6.0. Multiple town planning schemes were designed and implemented under the guidance of the progressive rulers of Bhavnagar. During the reign of Sir Takhtsinhji, the British State Engineer Proctor Sims supervised the construction of Barton Library, Sir Takhtsinhji Hospital. Takhteshwar Temple (1893) is located on a hill, on a high plinth, offering a commanding view of Bhavnagar. The high shikhara rising above the pillared rectangular mandapa makes it an important landmark. Gangajalia (1893) is a temple dedicated to Ganga-Devi, with a chhatri, pavilion, and bridge all of white marble. It is located in the middle of a former tank. It was designed by Sir John Griffith, principal of Sir J J School of Arts, Bombay. Nilambag Palace (1894), now a heritage hotel, is set amidst a huge estate of 10 acres (4.0 ha). It was designed by a British architect, William Emerson as a royal residence; he also designed the Sir Takhtsinhji Hospital and later Victoria Memorial in Calcutta. It combines elements of Indian architecture with a modern outlook. Barton Library (1895) is a two-storeyed building, appropriately designed for a road junction. It has two wings and a central tower, constructed in ashlar stone masonry, with Gothic arch windows and a sloping roof with Mangalore tiles. It is one of the oldest libraries of Gujarat and also houses a museum. Town Hall (1932) was formerly a Darbar Hall, where the coronation of Sir Krishnakumarsinhji took place. It is an imposing structure in the colonial style, set in a well laid out garden. Modern Bhavnagar comprises Takhteshvar Plots, Krishnanagar, Sardarnagar and surrounding area. During 1935–1937, Krishnanagar area was planned and developed by late Shri Virendrabhai C. Mehta, the official town planner for the State of Bhavnagar. In 1961, he extended his Krishnanagar plan towards Sardarnagar. In 1975, he created a master plan for Bhavnagar. A salient feature of town planning is to have gardens at the junction of roads. Gardens are located at Ghogha Circle, Mahila College Circle, Rupani Circle, Meghani Circle, Shivaji Circle, Sardarnagar Circle, Jewels Circle and Crescent Circle. The city of Bhavnagar was one of the earliest towns to have underground drainage in Gujarat, and was among the first cities in Gujarat to have a water filtration plant. When set up by Krushnakumarsinhji, the filtration plant was the largest in Asia. Industrial development in Bhavnagar district could be attributed to the presence of a large number of diamond cutting and polishing units, salt and marine chemicals, plastics, shipbuilding, and ship-breaking industries. Bhavnagar is an important center for the diamond cutting and polishing industry in Gujarat as well as India. Thousands of skilled diamond-polishing workers are employed in diamond-cutting and polishing firms, whose subsidiary offices are involved in cities like Surat, Mumbai, and Antwerp. Bhavnagar stands second in the diamond cutting and polishing industry after Surat in India, with 6,000 units operating from the district and employing more than 300,000 people. Bhavnagar's commercial importance is enhanced by its proximity to the Gulf of Cambay and the Arabian Sea. Bhavnagar is the largest producer of salt, with 34,500 tons of salt being produced annually in the district. The Alang ship breaking yard is the biggest in the world, recycling about 50% of the salvaged ships of the world. This has also helped develop supporting industries, such as oxygen bottling plants, re-rolling mills, and induction furnaces. Bhavnagar manufactures fiberglass reinforced plastic (FRP) boats and steel vessels at the shipbuilding facility of Alcock Ashdown (Gujarat) Ltd. The prominent industries located in Bhavnagar are Alcock Ashdown (Government of Gujarat undertaking), Tamboli Castings Limited, Excel, SteelCast Bhavnagar, Investment & Precision Castings, Elite Chemicals and Sound Build Care Pvt Ltd. Ruvapari Road and Nari Road are areas where most industries are clustered. Bhavnagar has about 150 units manufacturing plastic monofilaments, and more than 400 units manufacturing plastic cloth, twine, ropes, films, and multifilament yarn. Some sections of the society depend on agriculture for their livelihood. The city is a prominent trading post for cotton products. There are 112 medium and large scale industries located in Bhavnagar district. The district has 10,080 SSI units with employment of 49,587 involving a total investment of ₹ 28,955 lakhs (USD 70.62 million). Around 4,460 SSI units are present in Bhavnagar taluka, witnessing investments to the tune of ₹ 995.6 million (USD 24.28 million). Other industries are repairing and servicing, textiles, chemicals, glass and ceramics, and wood products. As per the Industrial Entrepreneur Memoranda (IEMs) filed, the total investment during 1988–1997 was ₹ 2,693 Crore (USD 657 million), and during 1998–2007 investments worth ₹ 47.75 billion (USD 1,164.6 million) were undertaken. Around 87% of the investments during 1998–2007 has been contributed by infrastructure projects, and the cement and gypsum, and chemicals sectors, while 89% of the investments during 1988–1997 was contributed by industries such as chemicals, cement, and gypsum. Miscellaneous machinery and engineering sector showed an increase in a number of units while chemicals, plastic, and food processing industries showed remarkable growth in investments during 1998–2007. Infrastructure sector attracted the highest investment of ₹ 2,200 Crore (USD 536.5 million) contributing 46% to total investments generated during 1998–2007.The next highest investment was generated by cement and gypsum sector of ₹ 1,637 Crore (USD 399.26 million) growing by 39% and contributing 34% to the total investments. The highest employment was generated by the chemical sector creating 3,997 jobs contributing 36% to the total jobs created. Food processing industries grew by over 250 times during 1998–2007 with an investment of ₹ 790 million (USD 19 million). A total of 11 (Memorandum of Understanding) MoUs were signed during Vibrant Gujarat Global Investor Summits (VGGIS) 2003, 2005 and 2007, in several sectors such as ports, power, agricultural and food processing, tourism, and mineral-based industries. The power sector witnessed investments of over ₹ 40 billion (USD 975.60 million) during VGGIS 2003 and 2005 by Nirma Chemicals Limited and Gujarat Petro Chemical Limited respectively. The maximum number of MoUs were signed in relation to the port sector during 2003 and 2005 in the district. Gujarat State Petronet Corporation (GSPC), has signed an MoU during Vibrant Gujarat 2007, for the privatisation of Bhavnagar port. Major investments were witnessed in infrastructure projects during 1998–2007 which would further enhance the image of the district as a commercial region. Recent surge in the growth of food processing industries in the district has increased employment opportunities for the masses. Presence of Bhavnagar port has helped in catalysing the growth of industries, making it an important terminal for trade. Proximity with other major industrial hubs of the State, such as Ahmedabad and Rajkot has helped the district in attracting investments. Small scale industry sectors such as repairing and servicing, textiles, chemicals, glass and ceramics, and wood products are the supporting pillars of the economy providing numerous employment opportunities. other large-scale manufacturing industries, such as fertiliser, soda-ash, steel casting, etc. As of 2011 India census, Bhavnagar had a population of 593,768. Bhavnagar has an average literacy rate of 86%, higher than the national average of 59.5%; with male literacy of 91% and female literacy of 80%. 10% of the population is under 6 years of age. Adult males constitute 52% of the population and females 48%. 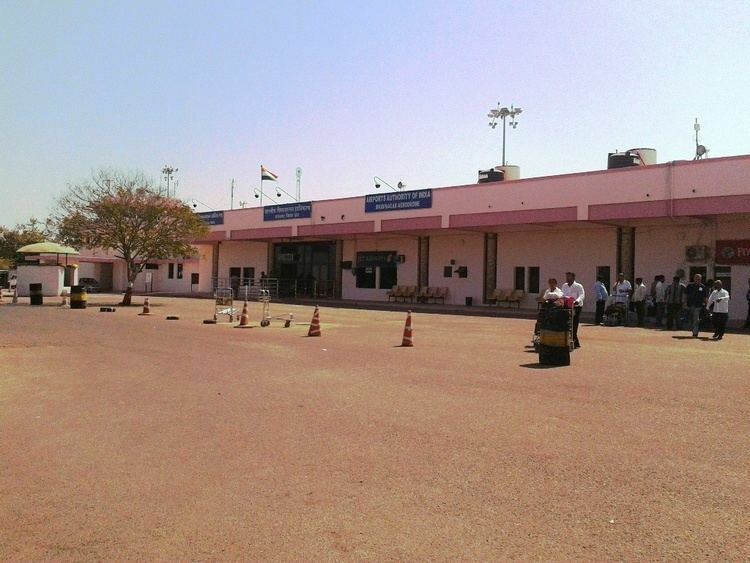 Bhavnagar is well-connected to other cities of Gujarat such as Ahmedabad, Vadodara and Surat by road, with bus services operated by the state-owned transport corporation. VTCOS buses serves as a local transport in the city. Bhavnagar Terminus under the Bhavnagar railway division, serving the city, connect it to Ahmedabad, Mumbai, Surat, Vadodara, Mangalore, Kochi, Quilon, Trivandrum, Mumbai, New Delhi, Kolkata, Chennai, Bangalore and other major cities of India by rail road. Private auto rickshaws are other modes of transport within the city and nearby villages. Nilambag Palace is the residence of the current Maharajah of Bhavnagar, HH Maharaol Vijayrajsinhji Virbhadrasinhji Gohil, and his family. It is now also a heritage palace hotel. Mangalsinhji Mahal Palace is the residence of members of the Bhavnagar royal family (the family of Maharajkumar Mangalsinhji Takhatsinhji of Bhavnagar). It is a historical property in the heart of Bhavnagar city and is designed on traditional Kathiawari architectural principles. It is now the formal residence of the descendants of Rajkumar Chandrajitsinhji Mangalsinhji of Bhavnagar. Bhav Vilas Palace was formerly the club-house for the royal family of the princely state of Bhavnagar, and currently the residence of Maharajkumar Shivbhadrasinhji Krishnakumarsinhji Gohil and his family. It is famous for its wildlife collection and lake-side views. Seashore at Ghogha features a sea-side palace, about 22 kilometres (14 mi) from Bhavangar, which was once a retreat of the Bhavnagar royal family, and is now a hotel-guesthouse for travellers. Barton Library is a two-storeyed building, with two wings and a central tower, constructed in ashlar stone masonry with gothic arch windows and a sloping roof with Mangalore tiles. It is one of the oldest libraries of Gujarat and also houses a museum. Ganga Deri (Ganga Jalia Talav) is a miniature of the Taj Mahal constructed entirely in marble. Gandhi Smriti is a memorial library for Mahatma Gandhi. It also has a fine collection of art objects representing the culture of the Saurashtra region. Central Salt and Marine Chemicals Research Institute (CSMCRI) is the only constituent laboratory of the Council of Scientific and Industrial Research (CSIR) in Gujarat. A significant research effort is being carried out here to develop biodiesel from Jatropha. Malnath Mahadev Temple (માળનાથ મહાદેવ મંદિર) is a temple of god Shiva as well as Picnic point nearby Bhavnagar. It's 26 km. away from Bhavnagar at Nagdhaniba Village from Bhavnagar-Talaja Road. Malnath hill wear Beauty of nature in Monsoon. Pillgarden, also called Sardar Baug, is a beautiful garden in the city. Bhavnagar had trade links with Southeast Asia, Africa, Arabia and ports of Red Sea since the early 18th century. The old port Bhavnagar Harbar was built by the state of Bhavnagar, and hosted a light beacon since 1860. This port was later modernised in 1930 under the supervision of J. Johnston, then port officer of Bhavnagar state. Wharfs, warehouses, and railway transportation were added. A new port, 8 kilometres (5.0 mi) south of the old port, was built and made operational in the 1950s due to heavy silting at the location of the old port. This port also had a lighthouse, which was damaged in the 2001 earthquake. Bhavnagar lockgate, built in 1963 and the first of its kind in India when built, is one of the oldest bundar in the state, and is very useful to keep ships afloat during low tide. Bhavnagar has produced many reformists, thinkers, socialists, poets, writers, artists, educationists, and independence activists. Gangasati – a medieval Gujarati saint poet who wrote many devotional songs. The shrine of Gangasati and Panbai is situated on the riverbed of the Kalubhar river. Gujarati novel Saraswatichandra by Govardhanram Tripathi was based on locations of Bhavnagar and Sihor.